But who's going to watch the watchers? 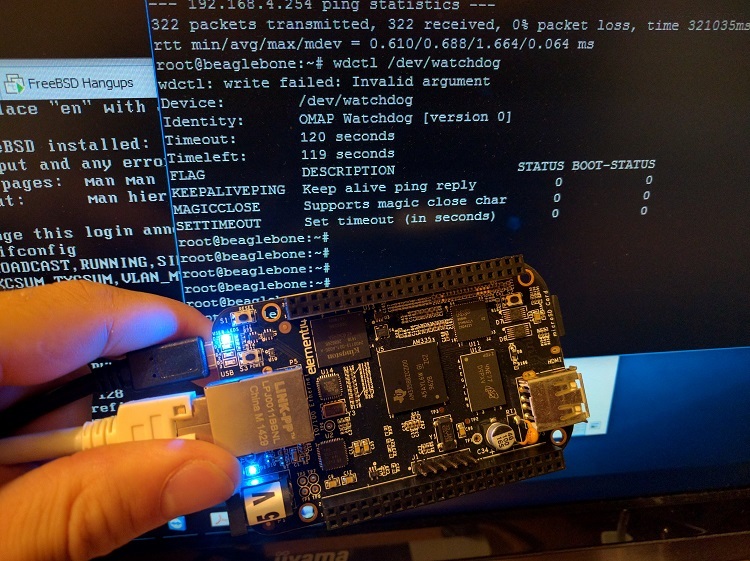 The BeagleBone Black's SoC (AM335x) includes a watchdog timer, that will reset the whole board is it isn't pingged regularly. Let's see if we can stop that thing running the latest Debian GNU/Linux to date. Ever since this commit, the OMAP watchdog driver has the magic close feature enabled. This means that closing the timer's device won't stop the timer from ticking. The only way to stop it is to send to it the magic character 'V' (a capital 'v'). This feature is particularly useful if you want the watchdog timer to only be active when a specific application is running, and if you then want it to be stopped when the application is stopped normally. Unfortunately, the kernel can be configure with a mode called "no way out", which means that even tough the magic close feature of the driver is enabled, it won't be honored at all, and you are doomed to ping your timer until the end of time once you opened the device. So, how do we stop that thing? That's it. Now if you send a 'V' to the watchdog right before closing it, it will be stopped.